My slow cookers are some of the most frequently used appliances in my kitchen. I use them all year round, warm weather and cold, for all kinds of recipes, but I had never used them for a dessert! 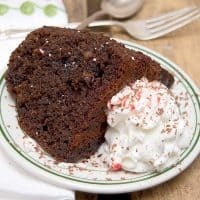 I recently saw a recipe similar to this Triple Chocolate Slow Cooker Cake on the Kraft.com web site and almost dismissed it because it was, well…cake. In the slow cooker? I did a little looking around on the internet and turns out that there are lots and lots of recipes for slow cooker desserts! Who knew? And how happy am I that I now have yet another use for my trusty, workhorse slow cookers! Of course, I just had to fiddle with the recipe a little to make it mine and also appropriate for the season. I can tell you that this was one of the most moist, chocolate-y cakes I’ve had in a long while and the whipped cream with peppermint candies make it a great holiday treat. If you’ve never used your slow cooker for a cake, believe me you’re going to love it! 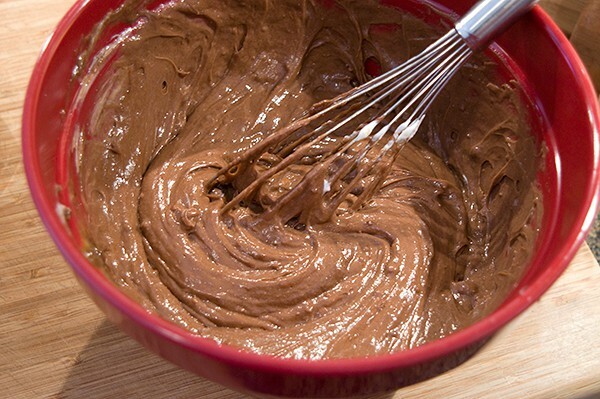 In a large bowl, combine cake mix and pudding. Add sour cream, water, oil, and eggs. Mix until well blended using a wooden spoon or electric mixer. 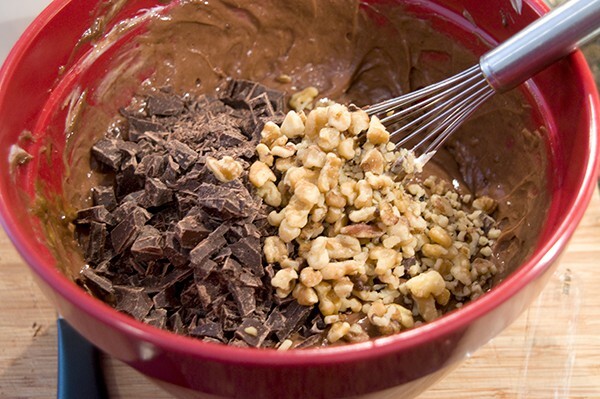 Stir in the chopped chocolate and walnuts. Spray the inside of the slow cooker thoroughly with cooking spray. 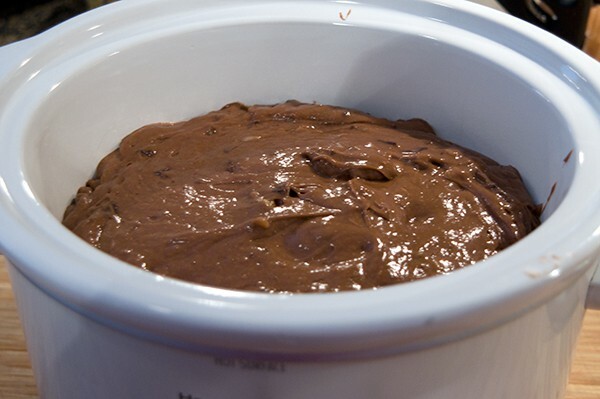 Pour cake mixture into slow cooker and cover. Cook 4-5 hours on low or 3-3 1/2 hours on high. When done, cake will have no wet spots on top and will begin to pull away from sides of cooker. Spoon portions of warm cake into bowls or onto dessert plate. Top with whipped cream and crushed peppermint candy. This delicious Triple Chocolate Slow Cooker Cake uses a boxed cake mix for convenience. In a large bowl, combine cake mix and pudding. Add sour cream, water, oil, and eggs. Mix until well blended using a wooden spoon or electric mixer. Stir in the chopped chocolate and walnuts. I have never made a cake in my slow cooker — but this looks and sounds delicious, Lana!! Thanks for the inspiration. I have never done it either, Kelly, but it is so easy and turns out great! Oh my, this looks and sounds divine! Thanks, Chris! We really enjoyed it. I had not either, but it turned out so well I’ll definitely develop more recipes like this! What size crock pot? I have several and want to use the right size. Love your blog. Keep up the good ideas. Barbara – this works best in one of the small 2.5 to 3 quart slow cookers. Either round or oval shaped. But, it sounds like one of those things to throw together as you go out the door for errands and the like, so that there’s a treat when you return (probably too exhausted to do anything else). I know! Who would have thought, but it’s really easy and really delicious!